Blue Willow plates are simply gorgeous and are definitely attractive as decorative items. This design has been featured in dinnerware lines since the 1700s, so it is a good pattern to collect if you are into collecting plates and decorating with them. 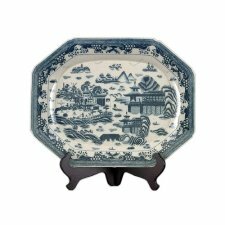 In the Blue Willow dinnerware line, you will find dinner plates, salad plates, dessert plates, and platters that look wonderful when displayed in a china cabinet, in wall hanging plate holders, or on easels. Johnson Brothers even makes Blue Willow square plates. The Blue Willow design is available in china, of course, but there are tons of decorative items that use the design. From lamps to rugs and from aprons to wallpaper, this design is an elegant decorating theme that is easy to mix and match for excellent home décor. You can even get Blue Willow fabric, which is a plus. A mixture of plates and platters look wonderful as wall hangings. This can be done in a kitchen or dining room, but I have even seen collections of plates over a bed or on a living room wall. There are plenty of Blue Willow dishes that can be used to accent the décor. These can be a Blue Willow tea set displayed on a coffee table, a vase filled with flowers displayed on a night stand, or a divided tray used on a dresser to keep jewelry organized. There are even trinket boxes made with the Blue Willow pattern. 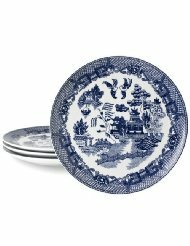 The Blue Willow pattern is timeless and it is so popular that you can find it in many types of home décor. It is a great theme for kitchens, dining rooms, living rooms or dens, offices, bedrooms, and bathrooms. 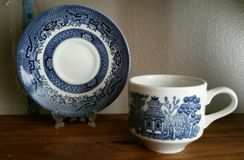 If you like Blue Willow plates learn more about the Blue Willow china pattern. You will be amazed by the history behind it and the legends that are related to the design. It is a wonderful pattern to collect.